Yep, we saddled up and headed out of Aiken without ever seeing the charms of historic Aiken or the cottage named Joye (although Robert said you can’t see much from the road anyway). Our disappointment was greatly mitigated, however, by visions of toilet valves and having a fully working water system in the Airstream. It took just about an hour to get repaired. Our planned trip to see Stone Mountain State Park and the Atlanta branch of the Frost clan was sadly abandoned. We’ll put that on the list for later as well. We headed south for a quick overnight at New Green Acres RV Park (more on RV parks at a later time) and then on to Savannah and the Skidaway Island State Park. 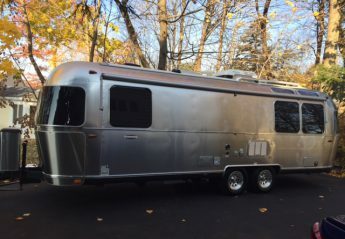 Sometimes GPS is tremendous and sometimes GPS just doesn’t think about traffic patterns and how they might impact towing a 27 foot Airstream. In this case Francine (the GPS lady) guided us right through the middle of tourist-laden Savannah’s narrow and crowded streets, past the surprised faces of tourists from Des Moines and Muncie and right smack into a bunch of streets under construction. I know my hair was standing on end. Thank heavens Jim has steadier nerves. Next Francine wanted us to enter the Harry S. Truman Parkway where no ramp existed! All of the locals were driving past the now defunct ramp, executing a tight u-turn and entering the highway from the other direction. Airstreams don’t do tight u-turns. But fate protects fools and panic-stricken Airstreamers—right where others were making the tight u-term there was a water treatment plant with a drive through. Huge signs decorated both sides of the narrow driveway saying, “Wrong way! Do not enter!” but we recognized salvation even if it meant transgression. Meeting no irate oncoming traffic, we completed our about face and entered the parkway. A little shaken, but none the worse for wear. Skidaway Island State Park is nestled just outside Savannah on the Skidaway Narrows and part of the intra-coastal waterway in Georgia. It is absolutely lovely. The campground is spacious and lined with live oaks and cascading Spanish moss. Arriving at the park, campers operate on a first come basis to find a camping site. We ultimately found a lovely and level site canopied by trees and just across from the only other Airstream in the park. Setting up was a joy. We put out our awnings, our veranda mat and folding chairs. Our Airstream neighbors across the road, Larry and Mary, were actually from just up the road. They had just got their darling Airstream Bambi and Larry was as full of enthusiasm as he was of questions. Jim stood a little taller realizing that finally there was someone who knew even less than he did about what was going on. Larry and Mary loved to talk. Walking near their Bambi pretty much guaranteed a good 30-minute chat. But, hey, what have we got to do? The park has lovely hiking trails which wind across marshland and give peeks to the waterway. We hiked all the trails in the two plus days we were there. Along the trails are historic bunkers used by the Confederate soldiers to defend Savannah and its shipping from the Union forces. One other thing we did do was take an afternoon walking tour of Savannah. With Dakota in tow, we needed a pet-friendly tour. Free Savannah Walking Tours was just what we needed. A no frills business started by two young native Savannans, we had a 90-minute guided tour of the key squares in the historic center of the city. Savannah was as gorgeous as I thought it would be. We saw the house (above) from Midnight in the Garden of Good and Evil and got a good sense of the historic squares and romantic buildings in the city. Walking is a great way to see things. There was one draw back. Of course, Dakota is quite beautiful and everyone wants to pet him and he is very friendly. But let a small dog walk by and Dakota sounds like he would easily tear him to bits in seconds. He is all bark and no bite. The whole time he is barking and growling, his tail is wagging, but he does make quite a scene. Every time another dog walked by, and it was frequent, or a horse-drawn carriage clopped past, Dakota lost his mind. He doesn’t actually have that much mind to lose and by the end of the afternoon, Jim was a wreck. Dakota causes more marital stress than all three of our children ever have. I would go back to Skidaway Island in a heartbeat. It was such a comfortable and lovely place to camp. We really enjoyed hiking the trails and the facilities were first-rate. We set up camp and could have stayed for a very long time. With a working kitchen including running water, we made a big meal of steak and all our favorites. Now this is what we signed up for! After three days we reluctantly headed south to our next destination: St. Augustine.